Set up the cones in a 40 X 20 yard box. These exercises should be done before each match. With the team captain leading and the rest of the team following in pairs, complete the following shuttle runs and stretches. Each exercise is done from one end to the other and the players then WALK back around the outside of the grid to begin next exercise. Put hands on bottom and kick heels up into the hands as you run to the end. Facing the outside of the grid, run sideways 2 steps before turning opposite way and repeating. Hold out hands palm downwards in front of stomach. Jog forwards making sure knees are brought up to the hands in a high knee lift. 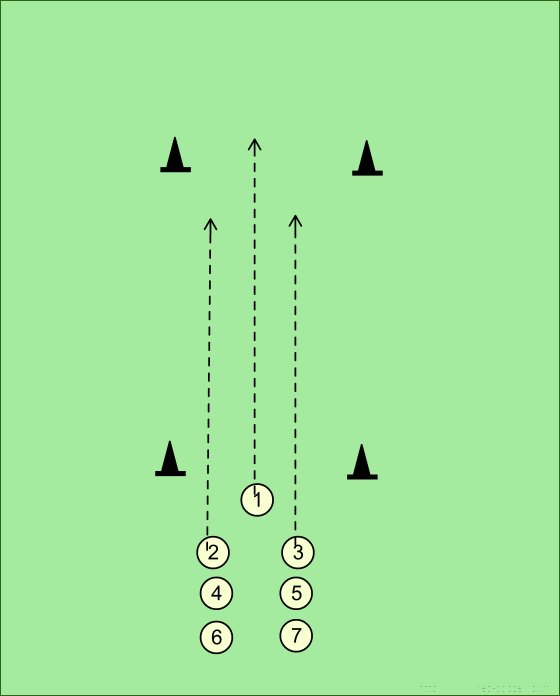 Run backwards gently for 3-4 strides, turn and sprint to end. Walking through the grid this time, lift left knee up level with stomach and then out over to the side before lowering to the floor. Repeat with right leg. Do each 3 or 4 times in grid. Again walking through the grid. Hold palm out in front of chest and try and kick your palm with toes. Do not force this exercise, allow own body to decide how far to kick. Slowly jogging through grid, drop to haunches and touch floor with both hands, stand up and head an imaginary ball. Repeat each 3-4 times in run. It is worthwhile taking the team through this warm up twice. 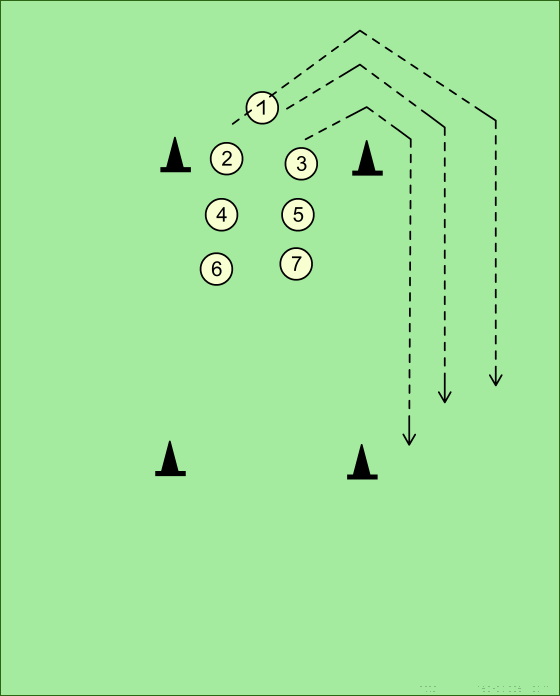 This should then be followed by the criss cross warm up, which is shown in another drill.